Indiana manufacturing employment has continued to rise from an all-time low in mid-2009 to current payroll levels reported to be only 1.1% below the pre-recession peak. 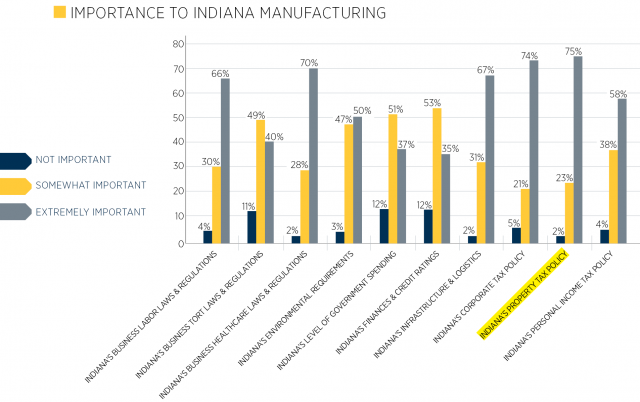 The future continues to look bright as forecasters expect the Indiana manufacturing sector to continue to rise above the other mid-western states, thanks largely in part to growth in automotive supply chains and the chemical industry. Indiana has continued to rank first in the Midwest and is in the top 5 nationally in several “business-friendly environment” surveys recently conducted. Indiana has attracted both national and global manufacturers with its numerous competitive advantages. Personal property taxes: Indiana collected 29% of property tax revenue from residential property and 71% from non-residential property (mostly commercial and industrial). According to Katz, Sapper & Miller's 2013 Indiana Manufacturing Survey, property taxes are a top concern for manufacturers. The House Bill 1001 would allow the county income tax council to adopt an ordinance to exempt from property taxation any new business personal property (other than utility personal property) located in the county. The Senate Bill 1 is proposing a plan that would result in taxpayers with assessed value < $25,000 to not be required to file a return, thus exempt from taxation. Repeal of the 30% Floor Introduction: Regulation 50 I.A.C. 4.2-4-9(a) “Minimum Valuation” states “the total valuation of a taxpayer’s assessable depreciable personal property in a single taxing district cannot be less than thirty percent of the adjusted cost of all property of the taxpayer.” Indiana is only 1 of 15 states with the adjusted cost approach and the only state with two floors. C-Corporation Taxes: The corporate income tax rate has already been reduced from 8.5% and is set to decrease to 6.5% in 2015. The Senate Bill 1 would drop this rate even further to 4.9% by 2019, making Indiana corporate taxes one of the lowest in the nation. Domestic Production Deduction: Indiana currently requires taxpayers add back to the state taxable income the amount claimed as a 9% federal deduction for qualified production activity income (QPAI) (House Bill 1038). Repeal of this “addback” would reduce state taxable income for both C corps and pass-through entities. Hoosier Business Investment Tax Credits: Currently these credits are non-refundable, but the bill currently proposed (House Bill 1055) would make these credits refundable at IEDC discretion. Manufacturing is the leading industry in Indiana. Growth is expected in the near future for the manufacturing industry — both statewide and nationally. Several bills are being proposed that are taxpayer friendly, thus helping to continue the momentum of manufacturing in Indiana. These are just a few of the highlights Indiana has to be proud of and can build upon as it continues its efforts to entice manufacturing growth to the state. So far, so good — Indiana seems to be moving in the right direction.